This photo was taken on July 3, at 12:38 pm. The location was at my house using the blanket on my bed for background color. The "Take It!" was the realization that the season for street fishing for knit hats is really over. 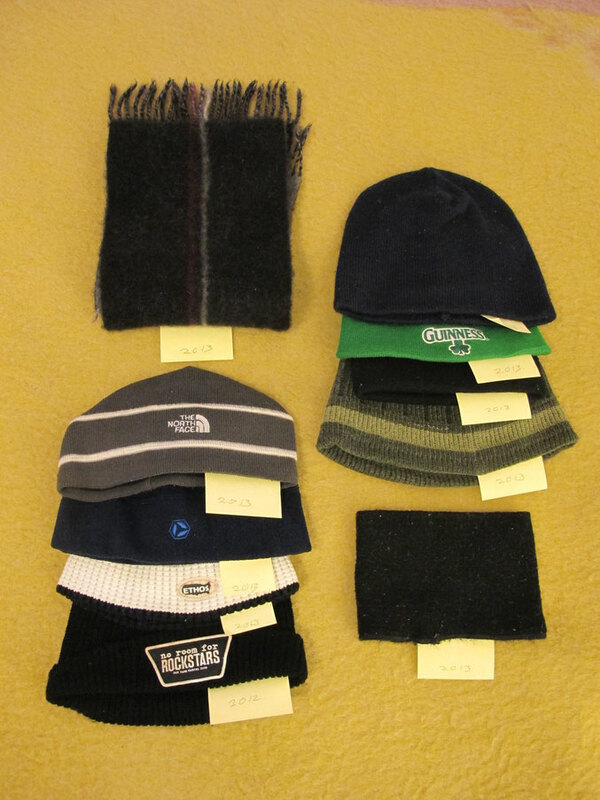 The hats, head band and scarf are just a few of those that I picked up off the cold street during the winters of this and last year. For some reason, several years ago, after observing these sort of items in the street having been lost by their owners - thought I might be able to recesitate them by washing them in my washing machine at home using a combination of; hot water, laundry soap and last but certainly not least - Simple Green. Happily, the first experiment was a resounding success. After having washed them - I put the hats on something to help keep their shape while drying. The After Take: I have offered these "rescued items" to select people. All of them have enjoyed the story of their having been brought in from the cold and given a new lease on not only their own life - but that of someone else as well. Again - the offer of these items is only made to those who I think will value them. This is an activity I was not certain I was going to share - but decided - that it was just too good not to pass along on the chance that someone else might want to bring a bit of recycled warmth to either themselves or someone else. Yes - the initial pick up of the items is a bit icky - but for this I carry a gallon sized zip lock bag in which I have some small Ice cube tongs that enable me to keep my fingers clean. I keep this bag with me during the winter for the carry home and put it in the washing machine steps. I must note - there are numerous hand washings done before the items come out of the washing machine. I guess I could call this the sharing of what in part is a dirty little secret - that is turned clean with just a little bit of effort and actually becomes a happy story. PS: I have not taken on gloves - as have never found a matched pair of them together. I think I once heard of an organization that took in single gloves and after cleaning them - matched them up with another of the same size and sent them out knowing the recipients would not care if they were not matched, for the only reaction they would have, was that of joy, in having their hands warm. You got a nice collection going there. Oh man, just from the street? Wow! Great pic! You are set for winter, that's for sure. I'm guessing Pine Sol kills lice, so you should be alright.